Hodgins, Cam and Angela in the first half of Bones' two-part 2013 premiere. "The Diamond in the Rough" airs January 14, 2013. Another photo from the first half of Bones' two-part 2013 premiere. "The Diamond in the Rough" airs January 14, 2013. A photo from the first half of Bones' two-part 2013 premiere. "The Diamond in the Rough" airs January 14, 2013. 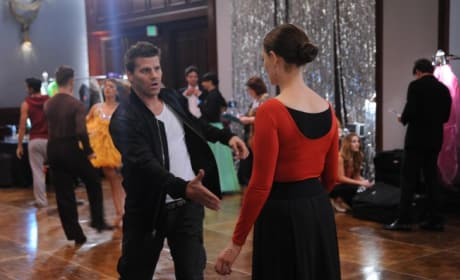 Booth and Brennan at the dance hall in the first half of Bones' two-part 2013 premiere. "The Diamond in the Rough" airs January 14, 2013. Booth gets his hair spray on in the first half of Bones' two-part 2013 premiere. "The Diamond in the Rough" airs January 14, 2013. B and B in the first half of Bones' two-part 2013 premiere. "The Diamond in the Rough" airs January 14, 2013. Booth and Brennan bust moves left and right in the first half of Bones' two-part 2013 premiere. "The Diamond in the Rough" airs January 14, 2013.